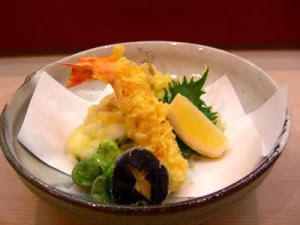 Tempura are deep-fried dishes of vegetables, fish and shellfish. The ingredients of tempura are dipped in a thin batter and fried until crisp in high temperature oil. Tempura is eaten with salt or dipping sauce called “tentsuyu”, which is made with broth and soy sauce.